Sometimes all you need is a trip to the ocean. Even if it rains the whole time you are there and the wind shakes your little motel room so that you think it might blow away. The ocean can restore so many things. that light that you have to share. 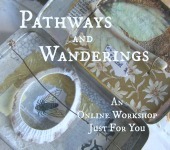 Last weekend I taught two workshops at Sage Place in Bandon By The Sea. To see work samples from Land, Water and Sky please click here. And to see work samples from Windows To My World please click here. Such lovely students I had, a such a beautiful studio to work in. Art flowed just like the waves on the shore. My husband couldn't go with me this time, so I found a little motel with a gorgeous view of the sea and a fireplace. Before I went to sleep each night I could watch the waves and the glow of the fire all at the same time. Preparing for my collaborative show, "The Story Within," at Ilahee Gallery in Ashland, Oregon with Seth Apter has been nothing short of joyful. In every painting there is a story within, needing to be told and waiting to be discovered. In this group of paintings, Oregon artist Roxanne Evans Stout and New York artist Seth Apter collaborate to tell their story. From a distance you will see beautiful abstract paintings...deep and mysterious... but on closer inspection layers, textures and colors will unfold pulling you closer for examination. Part encaustic, part acrylic and part plaster, these paintings are a unique blend of the artists themselves. Each of these twelve painting has traveled back and forth across the United States for the last year. One artist would begin, and the other artist finish until “the story within” was revealed. The story unique to each artist is also told side-by-side in an intimate grouping of individual work. 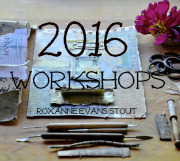 Oh Roxanne it is wonderful to see some of our collaborative work here -- especially the pieces that you have recently completed that I have not yet seen. I am very excited for the opening and the chance to see all this work hung together for the first time. You and Seth have a wonderful synergy going on! It sounds wonderful and your images take me there. I love the work you and Seth have done and wish you the best on your show. I am transported to a cozy little room with a fireplace and a view of the sea with the weather whipping at the windows. Nothing like it. Oh, and do I spy some eco-dyed wool and mica up there? Such a beautiful post, Roxanne. I'm lucky enough to live close to the sea (the Tasman Sea, down in the Southern Hemisphere) and never fail to find inspiration there. Your work with Seth is stunning, I so wish I could see it. glorious works! it will be a fab show....just wonderful, roxanne! Oh what a delight to read (and reread) this post Roxanne. There is so much to see, so much to hear, so much to think about. 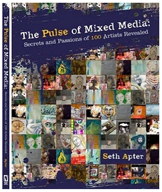 I read it and want to tell you so many things...Beautiful creations with Seth - so want to see them in person!!! Loved the written description!!! Wonderful sounding classes and yes the beautiful ocean! All so delightful... reading it warmed my heart. You have been so creatively busy! Great post and I know that area...rain or shine it is a beautiful place for all things restorative! The show description is perfect and the two of you will have a great show...congratulations in advance!! After reading this post and thinking about my love of the ocean (and reading the other comments), I don't believe I have EVER heard anyone say they don't like the ocean or want to be near it. It has a pull that makes us love it and desire to be near it to observe its many sights and sounds. The artwork that you and Seth have created together is outstanding, Roxanne. You are both so creative, making art that causes us to observe every little element on the canvas. I think I will wish on a star tonight ~ a trip to the ocean might just be what I am needing to calm the inner storm. Amazing collaboration! I love Life Saver..... and the rainy image of the sea. you are so right , the sea is mending many a hard difficult thought,and refreshing our minds, for more beauty to be created. Oh yes... the ocean... mmmmm. What a great assortment of work, and the show sounds like its going to be great. Congratulations and happy spring to you! Beautiful Roxanne. I love it all, the seaside story and all the art. The description of the show is perfect.